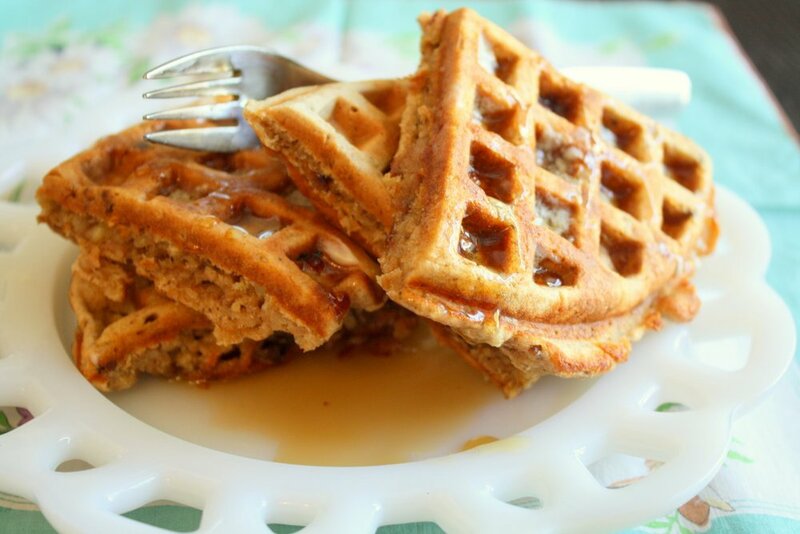 Today is Oatmeal Nut Waffle Day. And I object. I don’t object to oatmeal nut waffles, I’m sure they’re tasty and good for you. I object to this insanely specific day. I can go along with Waffle Day or World Nut Day, maybe even Oatmeal Waffle Day, but when you get down to a double-modifier, you’re just being ridiculous. Bottom line: Eat whatever waffles you want. 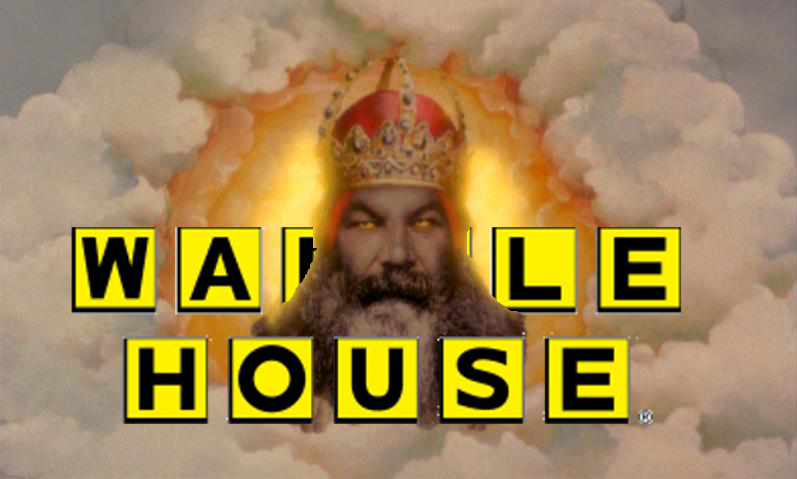 The Waffle God will still be appeased. < Previous Light Twenty Stakes . . .
Heh heh heh. Waffle God. It is ultra specific. Perhaps these days are sponsored and both Planters and General Mills wanted the same day, so they comprised, or something. Waffles good. Nuts in waffles bad. Hope the hand of the waffle god doesn’t smite me, I had a bowl of oatmeal and threw some almonds on top. Still trying to shake off the six pounds I put on since moving back to L.A. I think it comes from experiencing a real winter. Come visit me in Michigan if you want to experience winter. Today’s high is 20F. And we have no power, and therefore no heat here in Ann Arbor, but promises of power by midnight. The cats can hardly wait. You got up to 20?! Here in upstate NY we managed 15. So jealous. I had porridge (although I did put pecans in it, so that’s the nuts part). I’ve put on 11 lbs in the 11 months since I hurt my knee. Sigh. And real winter definitely isn’t helping. When I was a teenager, my parents bought frozen waffles by the case. I can close my eyes and taste toaster-burnt, butter-and-sugar soaked cardboard, eaten as I ran to catch the bus for high school. Hey, Kelly S., thanks again for recommending “Designing Your Life”–although I got stopped cold by articulating my work view and life view. Turns out I think that both work and life should be hard, and if it’s *not* hard, I must be doing something wrong. Aaaaagh! Now I am putting that new self-knowledge to good use. Salpy, hope your journey is going well. Great! I’m glad it helped. I’m stuck at the assess what gives/takes energy from me. Haven’t been able to convince myself to stop & take notes. Not sure why. Maybe I’m afraid of what I’ll learn. ? These super specific days make me smile. The idea that someone, somewhere, cared enough about oatmeal nut waffles to lobby to get them their own day is nice. Off the top of my head I can’t think of any niche interest I love enough to put forth that much effort for, but Oatmeal Nut Waffle Enthusiast did. It’s kind of inspiring. Don’t think of it as “weirdly specific type of food” day, think of it as “person who loves weirdly specific food enough to champion it to everyone” day. As I go about my business today I’ll try to remember to be more like Oatmeal Nut Waffle Enthusiast. Love your way of looking at it! Agreed! That’s a wonderful perspective! Now I need to make waffles for dinner. I have a wonderful recipe from my great-aunt that makes the best waffles ever. But I’ve already eaten oatmeal today, and the boy-child is allergic to nuts, so our waffles will not be Of The Day. Think of it as justifying some PR person’s annual bonus. I just arranged to donate to the god of brownies before I saw this. I’ve been trying to think. There are so many I loved. Doppelganland. Tabula Rasa. Hush. And of course, Once More With Feeling. Mostly I remember scenes, like the “Goodbye to You” scene at the end of one episode. Or the “one good day” scene where Spike explains that slayers are a little in love with death. Or Spike and Joyce meeting again: “Have we met?” “You hit me with an ax once.” The scene in Hush where Riley and Buffy come face to face and realize they don’t know each other at all. I really need to watch this again. And now Buffy lines are creeping into Nita’s book. Her sister is a fan and Rab did one of his master’s theses on Buffy and Angel. So much fun. In other news, I wrote 4000 words of Act Two tonight. Since there’s only about 25,000 words in Act Two, and since I already have more than that written (remember the night club scene? ), I am, indeed, picking up speed. Except that now I want to watch Buffy. I think you’ve posted this on the wrong thread, Jenny. It’s the one before Cherry Saturday that’s about Buffy. Really glad the book’s going so well. Good catch. I’ll move it. Thanks! Sorry to be off topic, but finally having dipped into Limitless, I think you would really enjoy Chuck. It has a similar premise, deals with similar character themes, but is not a procedural. It has an even stronger focus on family and team-building and has a great sense of romantic comedy. It’s also like if Limitless amped up those fantasy sequence stylizations, and was more overtly comedic in general. Best of all, it completed its story with 5 seasons, and you can tell the writers all really loved their characters, wanting to do right by them first and foremost. Beautifully optimistic and fun show. Unfortunately, Chuck is not on Netflix anymore. I’ve seen all but the last season of Chuck and loved it. I thought they did really interesting things with upping the ante each season. I’ve avoided the last season because of the spoilers I’ve read. But it’s really one of those shows you can watch over and over. I liked Limitless because it was less fantasy–once you accept the premise of the wonder drug which isn’t that unbelievable, as opposed to having the entire contents of US spy networks downloaded into somebody’s brain–and I thought the cast was outstanding, especially the comic timing of the lead, who could also do the heavy stuff. Yeah, I really liked the episode with Shauna, and the one where his Dad is suspicious. I really liked that Limitless kept his family a part of the conversation, not just paying lip service to the importance they had in the pilot. Plus, the actress for his mom is a favorite of mine. She played Nina Sharp in Fringe! I also love the various ways they deflate the fantasy sequences. In south carolina, it snowed today. Which is not what it is supposed to be doing in march in SC. It is supposed to be spring. So the lovely husband went to Waffle house and returned with fresh wafflely goodness, so I did not have to of get out of bed. He is awsome. According to NPR, Hawaii had more snow last month than Chicago… So keep the snowshoes handy in SC.